We arrived at Bukit Lawang at the end of a day that felt as long as a month and as improbable as a dream. The air in the bus was as hot as bath water and we scuffed relief into the dust as we unfolded ourselves for a crowd of men with motorbikes and easy smiles. They helped us with our bags, with our phones, with our stilted language and our tiredness, and we sat and ate rice and vegetables in the shade of a small restaurant awning, gulping too fast from bottles of pink fizz and feeling our brains switch on around the edges. Darma came to find us, his smile preceding him as he entered and, imperceptibly but irresistibly, lifting our travel-tired faces as we followed him back to the road. We took a motorbike taxi with our thighs and shoulders pressed into the metal frame surrounding us and the road shuddering beneath us, and then we walked, trailing mud and weariness, across a bridge and through a garden, dark green and calming, the sensible cousin of the forest just beyond that enticed and repelled us all at once. In the blank cool of a room untouched by the buzzing, biting tangle of life outside, we scraped gingerly at ingrained dirt and untested memories, the orangutan we’d already met at the surface of it all as we talked with voices cracking about his rescue from the trees. The evening, bamboo cannons and birds, turned into a night of rain and cicadas, thick blackness outside and geckos jaundiced by the electric light indoors, and we slept fitfully with our thoughts. In the morning, we forced protesting feet into boots heavy with damp and took our falsely hearty smiles to breakfast. Darma appeared again, irrepressible enthusiasm carrying us across the swaying bridge and through bewildering streets as narrow as alleys but bursting with everything we could ever want to buy. We crossed the river at its widest point, perching on an inflatable raft guided by ropes, listening to stories about rainfall and flooding, and the history of Gunung Leuser. On the path into the forest, we stood with everyone else, eyes on the canopy until the long tailed macaques swarming past our knees and darting across the sunlit gaps in nearby branches caught our attention, then held it, in slim, quick hands grooming babies with comical faces, and skinny arms taking part in loud juvenile scraps. Appearing as if from nowhere, the orangutan and her baby emerged from the endless towering green, orange hair and graceful movements sweeping everything else into momentary silence in our minds. As we stared, Darma appeared from behind us, the smallest of gestures beckoning us away, ducking under branches on a path that took us deeper into the forest. Shaking off the trees that grabbed at us with thorny hands, we ascended, eyes cast desperately towards every sun-drenched gap in the canopy as it enclosed us ever further. We scrambled, and we tripped on roots and slipped on mud, and we caught up with the macaques, who looked at us with unconcerned curiosity as we lumbered in their effortless footsteps. We scrambled, and we stopped suddenly, and we saw them, at our eye level in a tree engulfed in vines. They could have been the only animals in the world – mother engrossed in baby, and baby engrossed in branches and swinging and stretching a little bit further – a little bit bolder – each time. We remembered how to breathe and our minds woke up, putting the sadness and guilt away for a bit. We turned to Darma and smiled, relief and happiness and enchantment with these beautiful, fast, slow, elusive, bright animals – family – friends – as they settled for a while, picking through the leaves with all the time in the world. With half an eye on the orangutans, always, always watching, we talked to Darma about the forest and the monkeys, and the apes and all the trees, and the palm oil and the sadness and the anger we couldn’t hide. He told us stories perfect and heartbreaking, stories of orangutans released, and those who could never be the same. He told us about rivers and houses and some people we’d met, and so many we hadn’t, and he taught us that we are all in this together, no matter what we think. When the orangutans moved, we moved with them, strolling if we could see them, and tripping, racing, scrambling again if all the orange turned green. We watched them eat and play, and hold each other’s hands, and when she rested in her day nest in the heat of the afternoon, we recognised a mother resigned to the way a baby tests boundaries, dangling out of reach, looking back over one shoulder, testing one little arm in its haze of orange hair. The leaf monkeys joined us for a while, monochrome and aloof on branches way above our heads. A tiny baby, startlingly white, looked at us around its mother’s back, safe in long arms that kept it in place. A small bird hopped in arm’s reach and butterflies passed by, stopping in the sun on their way to somewhere else. 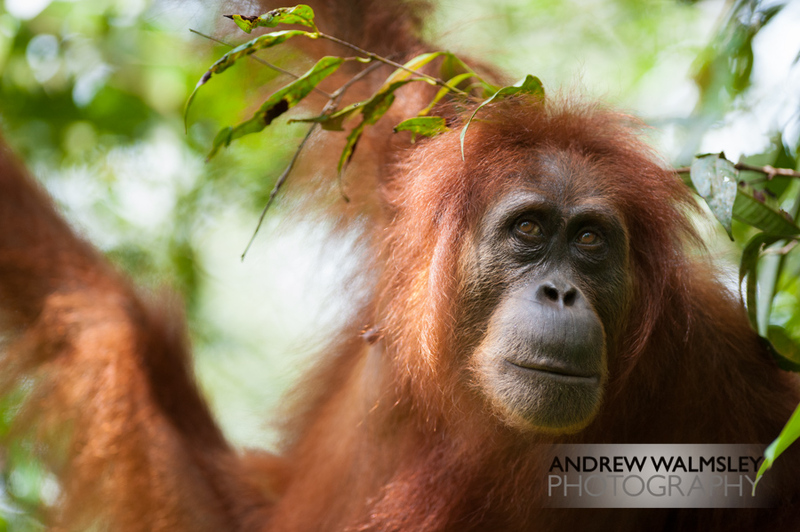 Still the orangutans sat, captivating us as the ants bit through our trousers and flies drank the sweat around our eyes. At three o’ clock they left the canopy, melting away from us as they made for the feeding platform and we struggled to keep up, and when we found them again they were nimbly, quickly, taking their bananas and turning to leave. Their orange forms got smaller until it seemed as if they were never there. We walked back along the river and thought about orangutans in captivity, in forests disappearing, in chains and boxes and cages, and about the life we’d seen that day. Darma told us there was hope left and he told us what to do, and he told us, breaking through our fear and helpless feelings, not to be angry. Being angry with people won’t help, he said. 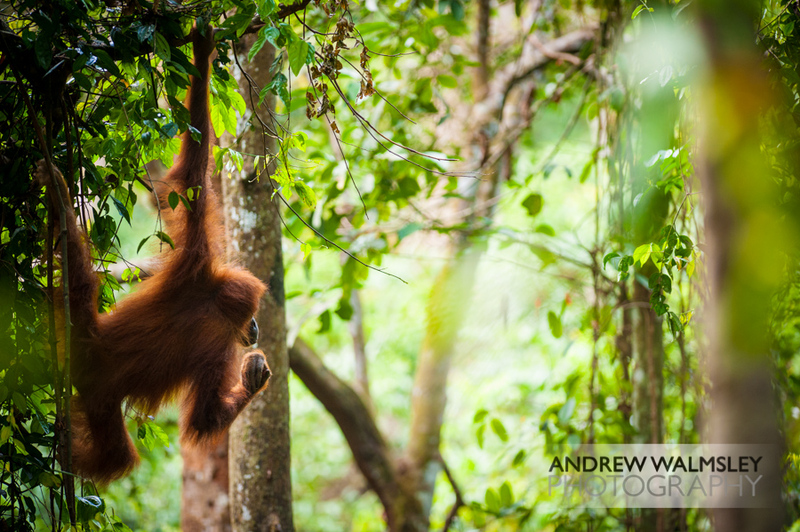 We have to make people love orangutans and trees and forests, and that’s how things will change. Sumatra’s orangutans, as those in Borneo, are in crisis, but there are people that love them, and there are people that care. My thanks go to some of these awe-inspiring people, without whom I wouldn’t have had the experience detailed above: to the staff and volunteers of Sumatran Orangutan Society and Orangutan Information Centre, and of course to Darma Pinem, whose wisdom and positivity inspire me still. Please click on the links and support the work of these organisations. Orangutans need your help.